Charm Shopping in Skagway, Gold Rush Town. We were having a good time on our Alaskan cruise and enjoying the fantastic scenery. For our second port, our ship stopped in Skagway. It has a history of being a gold rush town and we had a little gold rush of our own going around to all of the jewellery shops to collect free charms. First, we went on the outside deck of the ship to get a view of the surrounding area and see what the weather was like outside. It was a little bit cold but that was expected. Off the ship, there was a train you could catch to the Yukon which was not too far a journey. It cost more money than we were willing to spend but it does seem like a fun trip. Maybe something we might consider if we do an Alaskan cruise again. 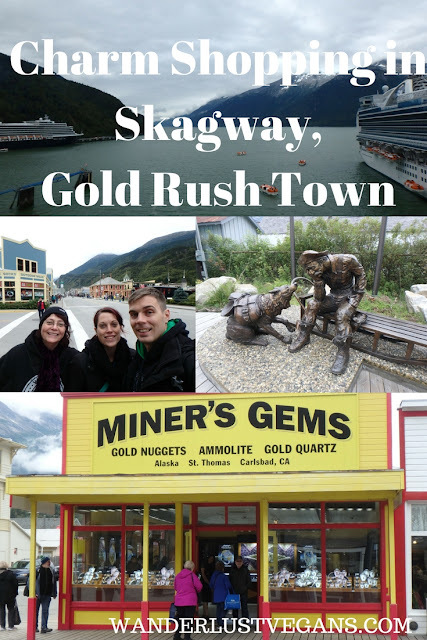 Skagway was a town that people would stop in on their way to the Yukon during the gold rush of the late 1800s. This miner looks a little down on his luck. All the buildings on the main street look have the gold rush era style but they are well kept. One of the popular things to buy in Alaska is jewellery. We found out about the free charms from some brochures on our cruise ship. We weren't really looking to pick up any jewellery but we decided to stop by a bunch of jewellery stores to get their free charms. All of the jewellery stores offer free charms to encourage customers to come in. The trick is to not get stuck talking to a salesperson. It's pretty difficult not to. A lot of the buildings are really unique looking in Skagway and it's fun to just walk around looking at all the old buildings. There is totem poles all over Alaska and Skagway is no different. Very cool. When visiting Skagway expect to see bars, jewellery shops and museums. It was fun walking along the boardwalk. There are a lot of historic buildings from early settlers of Skagway. We walked along one part of town where the "women of the night" used to work. The Brass Pic a self-proclaimed "House of Negotiable Affection". It was one of the ways that women were able to make money off of the gold rush and the influx of fortune seekers. A bunch of lonely men in town with a lot of time on their hands and money to spend. We up finding some vegan chocolate at one of the fudge shops. We never expected that they'd have vegan options but that is why it never hurts to ask. We got some chocolate covered almonds, peanuts and Oreos. Oreos are accidentally vegan in case you didn't know. We ended up finding some cheap Alaska t-shirts as well. There is no shortage of souvenir shops in these Alaska cruise ports, that's for sure. After a good time in Skagway, we moseyed back onto the cruise ship. If you enjoyed reading about our time in Skagway then you are not going to want to miss hearing about the rest of our Alaskan cruise and the different ports we went to. Look out for more on our time in Alaska including our time in Ketchikan.